This is my entry for the latest Different Strokes From Different Folks challenge. 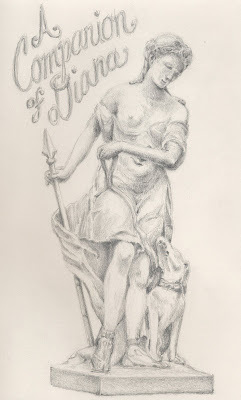 It is from Karin's reference photo of a sculpture called A Companion of Diana. The marble sculpture was done by Jean-Louse Lemoyne and is in the National Gallery of Art in DC. The nymph depicted in this sculpture with her hound, was a companion of Diana, the goddess of the moon and the hunt. 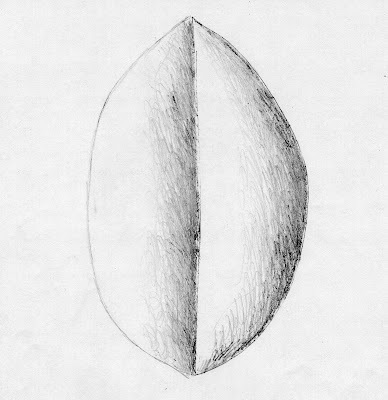 I first sketched out the entire thing to make sure I had the proportions right, then I used the "roundy-roundy" shading technique I learned in the botanical illustration class to finish it. Here was my sketch. 2. You can sketch anywhere-on the train, on the couch, on a bench in the park (I did all 3 of these to finish this challenge). 3. It is great practice of the basics. It's the first class you take in art school. 4. It can be quick and gestural, or highly detailed. I've known I wanted to do something with art pretty much all my life (except for that brief period where I thought I wanted to be a mailman because I thought driving around in those little post office trucks with the driver's seat on the other side looked like fun). I used to draw a lot as a kid, mostly interiors that included our cat, Hercules. 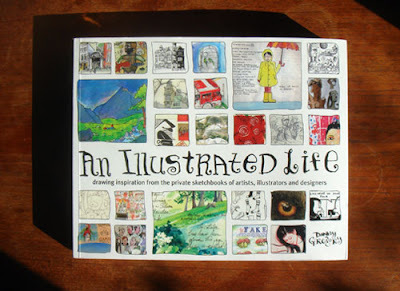 If you haven't yet checked out the book, An Illustrated Life by Danny Gregory, do it ASAP. He has collected images of 50 artist's sketchbooks and compiled it into one amazing book. I swear it will immediately inspire you to want to start journaling your life with drawing. On the final day of class, I remembered to take some photographs with the iPhone. Here is Sarah giving us a demonstration on how to paint the leaves. Remember we had started with a wash of lemon yellow nickel titanium and now we she is adding the layers of green. Sarah always has 2 brushes ready-one is your paint brush and the other is your water brush. 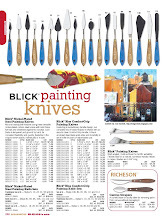 The advantage of this is that you can paint the color with one brush and the soften the edges using the other brush. She demonstrated this by by touching the painted edge with the water brush and "pulling" it out. A wash of the lemon yellow nickel titanium is also applied as a final step which helps to hold the color together on the leaves. 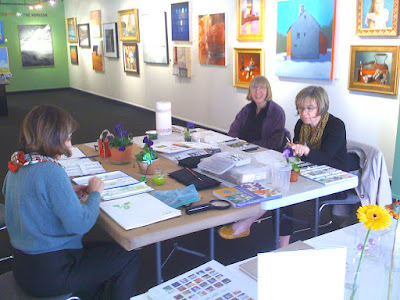 Towards the end of class, we moved on to start painting the pansy flowers. 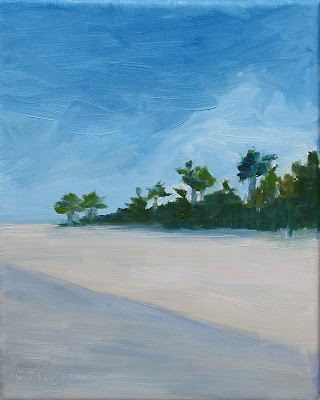 Again, lots of layering, always following our tonal study, and adding more and more detail as you go along. Here is my pansy painting as of the end of class. 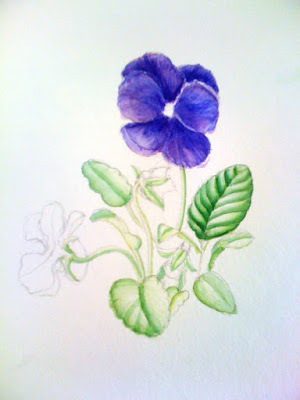 Sarah showed us one of her pansy paintings on vellum that she has been working on for 5 years. Whew, if it takes her that long, I can't even imagine how long this will take me to finish! 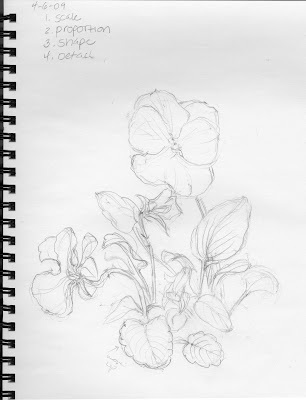 In the second class with botanical artist, Sarah Roche, we focused on creating a final composition based on our pansy plants. It is important to render the various growth stages of your plant and all of the varied leaf structures. One way to think about it is that if someone was looking for that plant, they could bring your drawing to a nursery and be able to identify it. Therefore, your drawing needs to be informative and as accurate as possible. 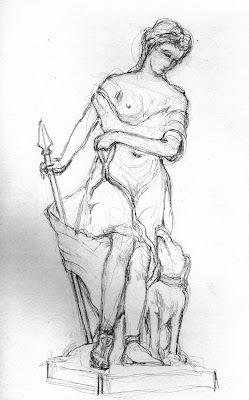 At the top of the sketch paper you will see the order of the stages you need to create your sketch-Scale, Proportion, Shape, and Detail. You want to first make sure you establish your scale by lightly mapping out the main parts and their relationship to one another. Then, you want to make sure your proportions are correct. At this point you are really just drawing very light lines to establish the dimensions. Then you start sketching in the basic shapes, and it's only once those things have been established that you should start to add detail. We used tracing paper to transfer our drawing onto the watercolor paper. After tracing our drawings, we flipped it over and retraced the lines again. To transfer our sketch onto the watercolor paper, we flipped it over again and traced it using a colored pencil. The reason you use a colored pencil is so that you can keep track of what lines you have already drawn. After the transfer, you can then add back in the detail to your drawing, making sure to keep the lines very light. Here is the handout she gave us that explains this process. 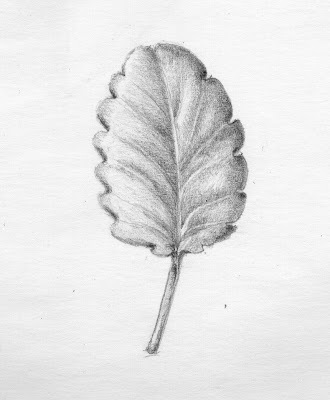 We used our tracing paper sketch to start establishing the tonal study for each leaf (remember the football diagram from my last post?) In our last few minutes of class-the time just flew by-we gave each leaf a quick wash of Lemon Yellow Nickel Titanium that represents the tonal areas we had just determined. I learned that botanical illustration is about layering, layering, and more layering, building up the colors very slowly. More about that in my next post-Day 3! 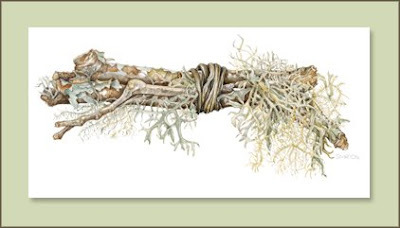 For the last three Monday mornings, I have been taking a wonderful class with botanical artist Sarah Roche. 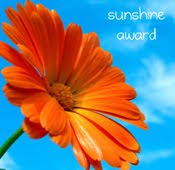 There was so much information to learn and share that I think I'll need to do a few separate posts. The first day we focused on shading from dark to light. 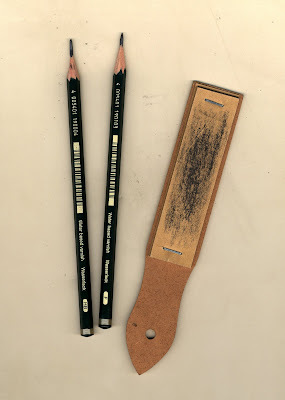 I thought I would show you how she sharpens the pencils (we used HB and F). Using an exacto or utility knife, she widdles the wood off the lead so that about 1/4" to 1/2" of the lead is exposed. This then allows you to sharpen the point by rubbing on the sandpaper . Sarah had us practice a tonal rendering technique she likes to call "roundy-roundy". You are really just caressing the paper with small circles that are overlapping and slowly build up as you go from dark to light. This was the first shape we had us render. 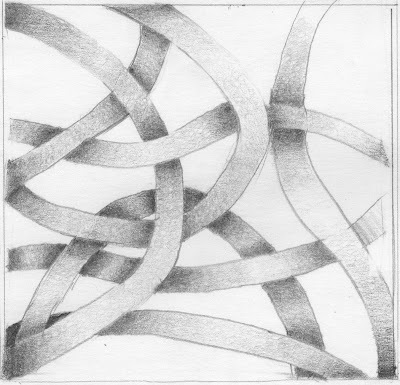 As a second practice exercise, she had us draw several strips that were overlapping one another on our paper. Here is my "fetticini" rendering. For this exercise, you want to make the strips in back the darkest and the strips in the front the lightest shades. If I was going to shade these before taking this class, I would probably use a combination of lines, cross hatching, and smudging with my finger. I found this roundy-roundy technique very relaxing and it forced me to take my time and really get in the zone. 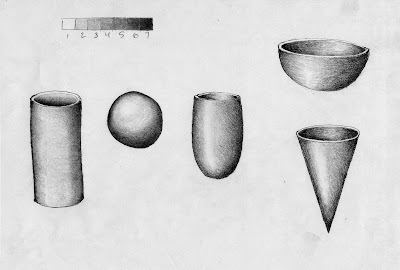 In botanical drawing, traditionally the light comes from the left. She showed us this "football" diagram and said that all leaves can be rendered with this shading once you see how the light is hitting it. Then, she gave each of us a purple pansy plant and we discussed the different types of leaves we could see, the varied growth stages of the flower, and the parts of the plant itself. She had us pick one leaf from the plant and, using this chart, we tried to identify it's outline, tip, base, etc. Here is my rendered pansy leaf. For homework practice, she had us shade each of these shapes. She says that most plants are made up of these different shapes, so knowing how to render them is critical. Note the scale at the top going from 1 to 7. You never want to have too much of one of these shades. It should be a smooth transition from dark to light. Wow-setting up an art show is a lot of work! Today, we went to the Moose Hill Gallery in Sharon to set up my husband Polo's art show, "Untamed Strokes of Nature" that opens this Thursday. It is amazing how much preparation work goes into the show and then how tiring the arranging, hammering, screwing, wiring, hanging, and straightening to set up the actual show can be. Thanks to show curator, Jan Goba, the results are stunning. We hope you can stop by the reception this Sunday from 1-4. Polo's sketchbooks and palettes will be also on display. The proud artist, ready for a beer! 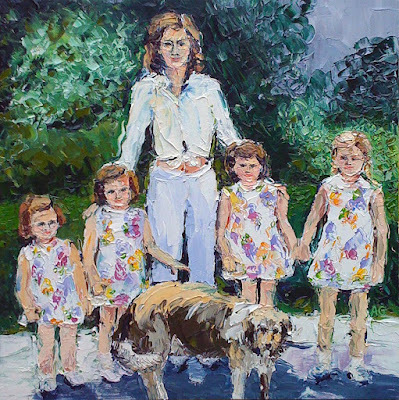 10" by 10" by 1.5"
This painting was another commissioned piece painted from a family photograph. I'm not sure if this was actually Easter, but I thought it was appropriate to post for Easter time. That's Julie's mom, Dolly, and her girls all dressed up in matching dresses. How cute is that? 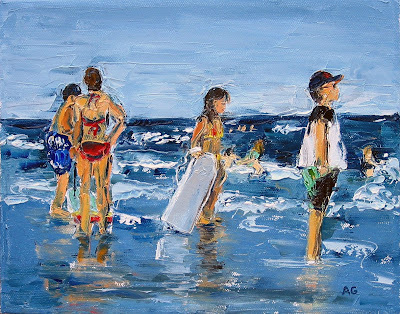 It is painted on a 10" by 10" artist board with my palette knife family. Awhile ago I wrote about a reference exchange we did during painting class. I picked Cindy's name. Below are the terrific pieces she painted based on some reference photos I gave her from my trip to the Dominican Republic. I just love the mood she captured in these paintings and decided to purchase them both from her as a wonderful reminder of my trip to that beautiful and friendly country. Thank you Cindy. 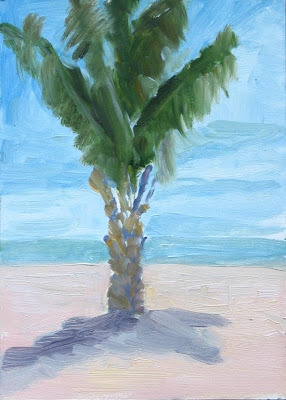 I wish I was drinking an El Presidente cerveza underneath that palm tree right now. This past Sunday was the second session of the artist lecture series at RISD. 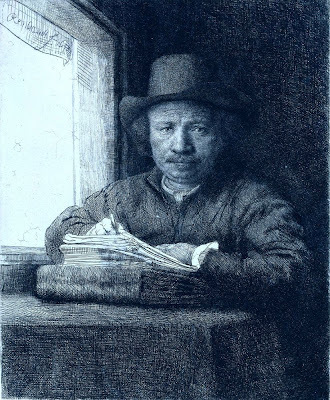 The focus was Rembrandt van Rijn. There is so much to learn about the artist, the two hour lecture can only touch the surface. He came from a lower middle class family, in Leiden, Holland (near the Rhine-thus the van Rijn of his name). Most of his life as a working artist was spent in Amsterdam. Franz Hals lived 12 miles away, but they never met. 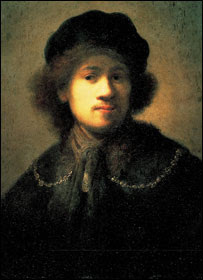 Unlike other painters of the time that mostly did commissions of biblical or idealized subject matter, Rembrandt painted what he wanted. He did not set out to make the perfect female form, nor paint men like nobility. Like Caravaggio, he painted in the moment, acknowledging the ordinary. He also had a sense of humor and satire often seen in his work as well. He decided when his artwork was "done" and often his commissions were rejected for being "unfinished." He was especially know for his etching techniques, which I enjoy. Look at the wonderful light he created in this self portrait. I found it interesting to know that he used to bid on and buy his own artwork and prints in order to drive up the prices. Even so, at the age of 63, he died penniless. His artwork considered "out of style" by then. 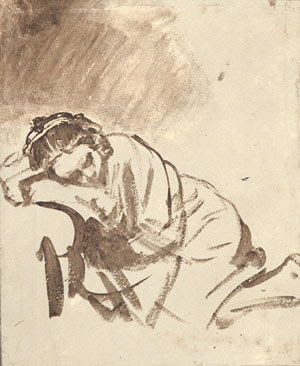 It is always insightful to see artists sketches and this one is no exception. You can already see where he plans to paint the deep darks. Below is portrait of his son, Titus, the only one of his 4 children to survive into adulthood. Look at that golden light. 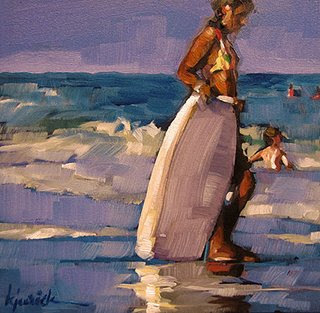 It's inspiring to see what he could achieve with his limited palette. Here is my submission to the current Different Strokes From Different Folks challenge. Ok-I wish that was my painting. It's really Karin's. 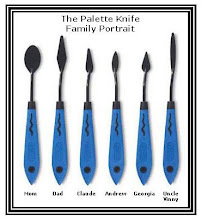 Below is the real Gorbett palette knife submission to the challenge, submitted on the last day of course. It's 8" by 10" on stretched canvas. I wanted to make a Red Sox hat on the guy which was difficult to do at this size with a knife, but anyway, I know it's there. And here is a detail. 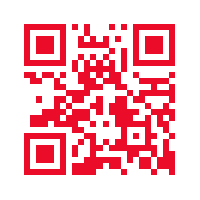 You can also click on the image above to see the entire painting in detail. 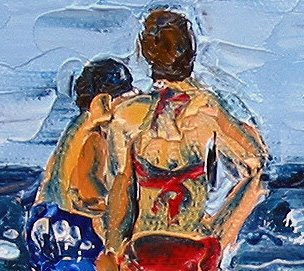 I just noticed now that the triangle created by the woman's arm should be a darker blue to match the water. Better fix that. The reference photo that Karin posted can be seen here.